I’m sad to announce that Pat McManus died on Wednesday evening, April 11, 2018. He retired from writing several years ago, and his health was declining. He passed away in a nursing facility in Spokane, WA. His humor and stories have brightened the lives of millions of readers over the course of his writing career. I have received many emails from fans expressing their gratitude and telling how his stories have helped them in dealing with PTSD. Many fans tell of the bonding experiences of their families over generations as they read his stories together. Sharing his stories has been a favorite part of my own family’s gatherings for many years. If you search on Audible.com for Pat McManus stories you will see they are narrated by quite a few different people—none of whom are George S. Irving. I have frequent inquiries about George S. Irving. Sadly, he passed away last December (2016). Here is the obituary. Here is a link to all Patrick’s books that can be found on Amazon.com. Click “All formats and editions” and you’ll see if there are audio tape versions available. They are from third-party sellers since they have been long out of production. Downloadable versions of George S. Irving’s recordings are not available. I’ve been trying to research how I might find them but the company that produced the audio cassettes has gone out of business and I’d have to hire a lawyer to track down the rights and permissions. Someday when I’m richer I plan on tackling that! Over the years I’ve had McManus fans ask me to pass on to Pat their gratitude for his stories and how they have impacted their lives. You don’t know me. But I grew up hearing your stories. My name is Chris Blotevogel, my father Eric was a Royal Ranger Commander (a Christian Boy Scout group). He read your stories not only to me and my brother, but to countless young boys across the state of Oklahoma. I’m not sure if you read your fan mail, but wanted to let you know that my father was one of your biggest fans. If I had a dollar for every tear he shed reading “the night the bear ate goombaw” or “cigars, logging trucks and know-it-alls”, I’d be a rather wealthy man. Words can’t express how much joy and happiness I saw in my father’s eyes when he read your stories from his death bed, it was a Fine and Pleasant Misery. I’m not sure how much it’s worth, but I’d like to thank you. Your creative stories have brought laughter into many homes, including my childhood home and now the home I raise my own children in. I’m sure I bore my children even now when we’re on road trips and they see me break out a paperback book. Keep up the amazing work, I look forward to your emails. What Has Pat Been Up To? 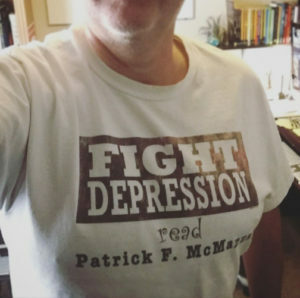 From time to time I have fans express their gratitude and love for Pat’s stories and ask about him, wishing him well, and wonder if there are going to be any more books coming out. I forward your letters and emails on to him. Here is the latest information I have. In 2014 Pat announced that he would be retiring from writing and public life and his official website would no longer be maintained. Up to that time it was managed and maintained by one of his daughters, with both Pat and his wife, Darlene (or Bun as she is known in his stories) writing monthly blogs. They also offered items for sale and links to sites of interest to his fans—including The McManus Index and the one-man plays based on his stories by actor Tom Behrens, as well as lots of information for writers. Before the website closed they mentioned a desire to compile and publish the blog posts, but I haven’t heard anything more about that. 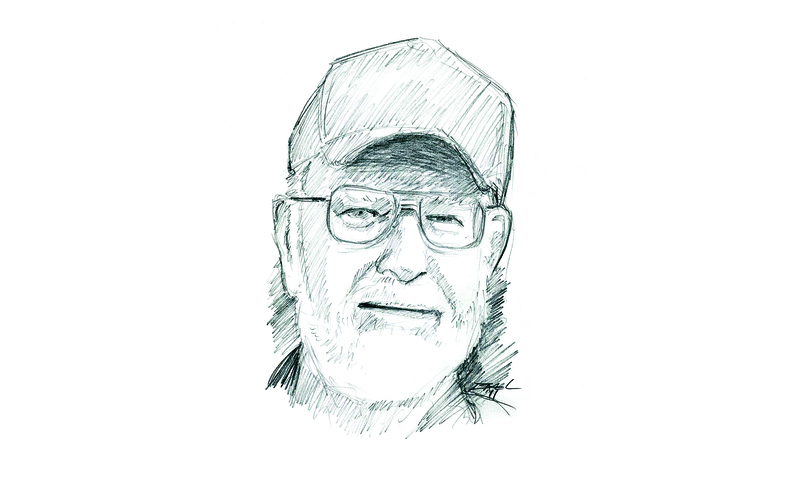 Pat stopped writing the “Exit Laughing” column for Outdoor Life in 2011 and devoted his writing efforts to the Sheriff Bo Tully mystery novels, the last of which appeared in 2014. Also in 2014 there were a couple new stories printed in Outdoor Life, but beyond that it’s been quiet as the McManus’s are hopefully enjoying their retirement and return to private life. Author Lauren BallPosted on July 20, 2017 July 20, 2017 Categories Pat McManus2 Comments on What Has Pat Been Up To? Here is a list of other winter stories to hopefully lighten up these cold, bleak days. The fever associated with cabin fever comes in many forms, but by far the worst is two-man-tent fever. When school gets canceled because of a blizzard, Rancid Crabtree shows Pat and Crazy Eddie Muldoon the proper way to ride an upside-down truck fender wearing a parachute. Found in the book They Shoot Canoes, Don’t They? Winter fishing is just as crazy as it sounds. In contemplating this malady Patrick also remembers the person responsible for exposing it to him: Rancid Crabtree. For six-year old Patrick entertainment was hard to come by in the dead of winter. Except for Tuesday evenings when they braved snow, ice, and wolves, to listen to the radio at the nearest neighbors. 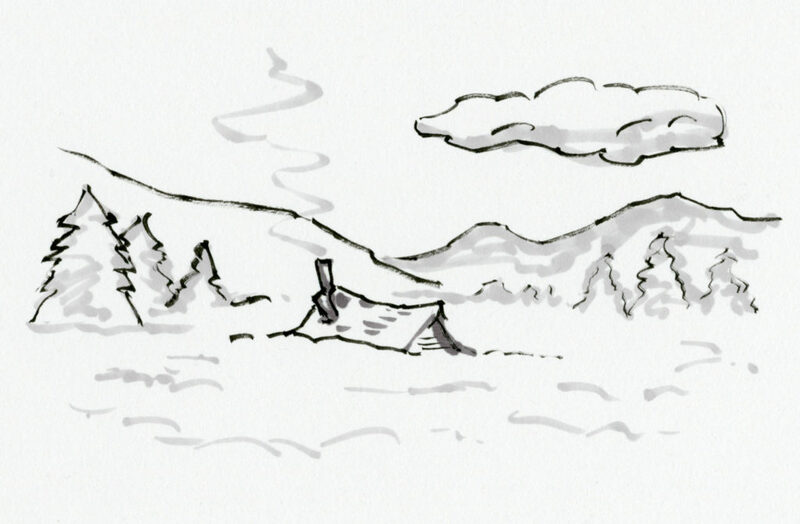 While Pat and Bun were taking a shortcut through the mountains in a blizzard, Pat was reminded of the time he and Crazy Eddie Muldoon built a snow cave during a blizzard in their youth. While Pat was playing hookey from school, Rancid Crabtree stops by and takes him ice fishing. Rancid falls through the hole in the ice and they build a fire to dry his clothes. Things were going as well as could be expected until some helpful neighbors come along and help Pat burn the old rags he had found. Patrick presents his journal of a winter expedition with Al Finley and Retch Sweeney to Tuttle Lake. When the fuel pump goes out in Retch’s new pickup, in the mountains, in a blizzard, Al Finley heroically fills in. With Valentine’s Day coming up we could always use a little inspiration to show that special someone how much they mean to us. Along with those flowers and chocolates, read them a Patrick McManus story and give them the gift of laughter as well. There were several girls in Patrick’s young life, some he had romantical feelings for. Unfortunately we can’t count the girl from a neighboring farm, Valvoleen Grooper, as she was his nemesis (remember “The Tin Horn” in The Night the Bear Ate Goombaw?). Most of his learning-of-love lessons were at various times between Melba Peachbottom and Olga Bonemarrow. But Patrick also learned the art of wooing from watching others—his friend Crazy Eddie Muldoon and mentor Rancid Crabtree. Backseats have long been known as the trysting place for young love, but for the outdoorsman it was his emergency shelter, gun rack, larder, and so much more. Patrick remembers his first honest-to goodness date with the radiant, shiny new Melba Peachbottom. Found in the book Kerplunk! Just prior to Patrick’s date with Olga Bonemarrow, Gram feeds the leftover turkey gravy from Thanksgiving dinner to the family dog, Strange, with disastrous consequences (of course). The lovely Miss Deets’s tenure as third grade teacher was a short one. Her ill-fated idea of Show and Tell began well enough, but when the poor kids brought in their “most interesting possessions,” the end was not far away. Rancid Crabtree has a bear in his brush pile and asks Patrick to help get it out. With further assistance from feisty Ginger Ann, they all get more than they expected. In the muddy spring of Pat’s sophomore year of high school, Retch Sweeney stops by with Mrs. Peabody. Retch is taking her to her friend’s house and Pat asks to go along and be dropped off at Rancid Crabtree’s shack. They get stuck in the mud and Mrs. Peabody suffers the indignity of Rancid’s rescue. In third grade, Pat’s teacher, Miss Deets, told the students they had to bring their fathers in to tell the class about their occupations. Since Patrick’s father had died, he convinces Rancid Crabtree to come instead. The story was “The Night the Bear Ate Goombaw.” I was immediately struck with Pat’s dry, understated style. He made it seem so easy. I had never read a story that made me laugh so much. As hysterical as his stories are when you’re reading them to yourself, to get the full effect you need to read them aloud, or listen to them being read. Those who know me know how much I love to read aloud. In my high-school years our family didn’t have a television so I would read out loud every night for our entertainment. I wish I had known about McManus back then. Later that afternoon when the family was all together I read “The Night the Bear Ate Goombaw” to everyone, as well as “A Really Fine Blizzard” and “Getting it in the Ear.” It seems like I can only read a few out loud at a time ’cause I’m exhausted from laughing. In the comments below tell us about your first McManus story. How old were you? How did you discover him? A couple months ago my wife and I moved to Coarsegold, California, about a half hour south of Yosemite National Forest. We’re finally settled in and enjoying the change in scenery and exploring the foothills of the Sierra Nevadas. There’s more wildlife here than we saw in suburban Utah. Squirrels and rabbits, of course, blue jays, finches, quail, hawks, deer, and we saw our first tarantula the other day! I’ll post some of the pictures soon. McManus Index has been helping people find their favorite Pat McManus stories for two years. Do you have any family or friends looking for a story they can’t find? Tell them about the index and send them our way! Many thanks to all of you who have purchased Where’s the One About the Bobcat. Author Lauren BallPosted on October 31, 2013 October 11, 2014 Categories McManus Index2 Comments on Two Years! I’ve researched all the stories about Pat’s dog, Strange, in all his books and have not found any mention of his dog running away. There is one story where Strange came home after being gone for two days and meeting their new cat, Matilda Jean (“Strange Meets Matilda Jean” in the book Real Ponies Don’t Go Oink!). I’ve even read through the memoirs he wrote in How I Got This Way and Whatchagot Stew, and no mention there either. Patrick said he has a stack of stories in his closet that have been published in various magazines but not yet collected in book form. It’s possible the story you’re looking for is not in one of his books yet. My index is only for all the stories that have appeared in his published books. If any of you are familiar with this story, please help us out in the comments below.